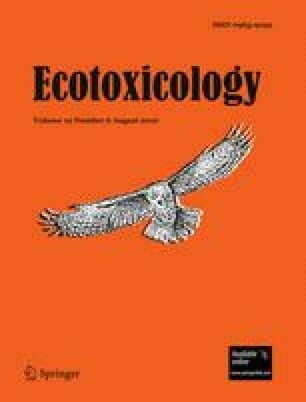 The objective of this study was to examine a relationship between cadmium (Cd) accumulation and histopathological changes in the kidneys and liver of magpies (Pica pica) from a zinc smelter area. The concentrations of metallothionein (MT) and glutathione (GSH) that are linked to a protective effect against Cd toxicity were also determined. There was a positive correlation between the concentration of Cd (2.2–17.9 μg/g) and histopathological changes (interstitial inflammation and tubular cell degeneration) in the kidneys (R s = 0.87, P = 0.0000). The renal Cd also positively correlated with apoptosis (R s = 0.72, P = 0.0005) but the metal did not affect lipid peroxidation. Notably, the average concentration of Cd in the kidneys exceeded MT capacity by about 7 μg/g which is thought to produce renal injury. Importantly, GSH level in the kidneys of magpies from the polluted area dropped to 38% of that observed in the reference birds, probably potentiating Cd toxicity. On the contrary, the liver accumulation of Cd was relatively small (0.88–3.38 μg/g), the hepatic MT capacity exceeded the total concentration of Cd and no association between the hepatic Cd and histopathology was found despite the fact that GSH level was only half that observed in the reference birds. The data suggest that Cd intoxication may be responsible for histopathological changes occurring in the kidneys of free-ranging magpies and that the pathology may be associated with inappropriate amount of renal MT and GSH.